If there’s one thing that epitomizes the Kentucky Derby, well, it’s probably a gigantic hat. But if there are two things that epitomize the Kentucky Derby, it’s a gigantic hat and whiskey. But as will surely be the case in Louisville, the real gem of the day is the bourbon. Whether you’re drinking a classic Mint Julep or downing whiskey straight, there’s no better place or time to celebrate Kentucky’s finest than at a celebration of the state’s most prestigious event. While it might break tradition, I’ve taken the liberty of concocting a host of bourbon cocktails, inspired by and in honor of the five top-ranked horses racing at the derby. I’m not specifying any brand of bourbon for these, because I believe very strongly in a drinker’s choice of whiskey. 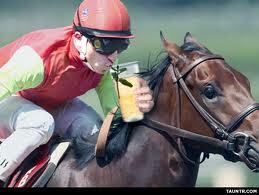 Drink responsibly and may the best horse win!